Liquid Fusion Kayaking: Where's Squeaky? 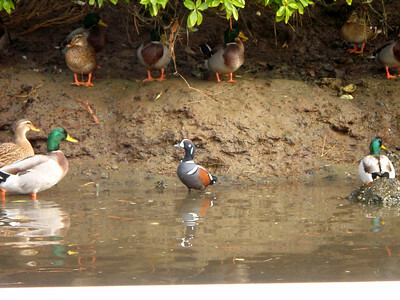 Missing - a very handsome male harlequin duck. When he walks, he favors his left leg. Here's a photo of him. He was last seen in April 15 (maybe he is fleeing the IRS) in the Noyo River near Fort Bragg, CA with a flock of mallards. Squeaky is an odd duck that we have been watching for the past 4 years. We nicknamed him Squeaky because his calls sound like someone squeezing a rubber ducky. We suspect that he migrated north but who knows where he travels on his jaunts away from the Noyo. We hope that he migrated north and found a mate and will return at the end of the breeding season. However with Squeaky, one never knows. Keep an eye out for him and let us know if you see him.